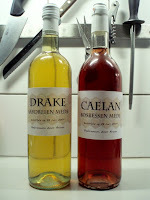 Yesterday I received the bottling supplies from the brew store, so it was bottling time for Caelan and Drake. Caelan had cleared further with the bentonite - actually in the photo I'd already siphoned it off the clay and in the process moved the demi just slightly, so it was even clearer at first. But I am clumsey, and I've learned to live with that. Both batches had been stabilised and showed no signs of life in the windowsill of my bedroom, so I think/hope they can be considered sufficiently done to pose no danger of explosion. 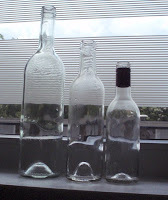 Here are the bottles I used - 0.75, 0.375 and 0.25 cl. The middle size I bought as it seems a lovely size to give away. The smaller size are recycled screw-tops and mostly intended to serve as samples. The larger size are also recycled. I also have some 1 litre bottles but changed my mind about using them as they seem overly huge. My batches are small, if the stuff does turn tasty in time it seems a shame to end up drinking almost a quarter of it in one go. 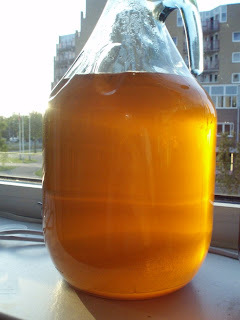 With the autosiphon and the bottling cane (flows if you depress the little pin at the end, stops the flow if you lift it) the transferring the mead was a painless and largely mess-less process. The corking was something else entirely! I had ordered 'quality 3 corks' which were said to be for bottling up to 5 years. I knew not to expect the world, but what I got were 50 corks were about 15 weren't waterproof by any definition, and 20 which crumbled. I had to seriously search the box for a good one, and even then I ended up having to filter and re-cork three bottles because there was cork in the mead. Grrr. I called the shop and they said they're not supposed to be like that and they're sending me new ones, but unless those are significantly better I'll know either to invest in Really Good Corks, or switch to screw- or fliptops. (The reason I prefer corks is... it's cheaper because I can recycle any old bottle, and it's easier if I give away bottles that don't have recycle value like flip-tops would have. Plus, it's kind of a fuss to get white-glass fliptops. They're not cheap. After I managed to cork as well as possible I put shrink caps on, except for one of the screwtop bottles which was too wide and got a cap of beeswax. Then I went and made labels. And then I went "Heee!" a lot and stored them in the wooden chest that is my coffee table. I'm getting ready to bottle for the first time, so figured having a practice run with the corker would be good. The first cork I forgot to soak, so that was a problem to get in and crumbled on getting out. Tried it again with a soaked cork and it went easier, but there's a problem - the pressure pin of the corker leaves this deep indentation in the cork, and it crumbles the top edges. I'm pretty sure the cork will crumble when I uncork the cottle. The second pic shows the business end of the corker and you can see that it doesn't put pressure on the edges of the cork. You can click the pics for more detailed view. Now these are old corks and an equally old corker - 15-20 years old in fact. Could this problem be due to the age of the corks? I was planning to buy new ones anyway. Or is the corker just not good and is that causing the problems? Help me, interwebs - do I need new corks, a new corker, or both? I guess I ought to look how many bottles I have ready, and maybe have a practise go with the corker..